Passengers wait for a bus in Curitiba, Brazil. The bus line is a pivotal component of the city’s transport network. Photo by mariordo59/Flickr. Bus Rapid Transit (BRT) is a cost-effective mass transportation system characterized by exclusive bus lanes and reduction of travel times, high-passenger capacity and level boarding, and a relatively short construction process. Latin America and Asia are becoming the world leaders of bus rapid transport (BRT) with 63.26% and 26.43% of world ridership, respectively. The introduction of BRT systems in these emerging countries raises the question of how a BRT network shapes citywide development, and in turn, what cities can do to ensure that public transport is a positive force in shaping environmentally sustainable and economically equitable cities. Transit oriented development (TOD) refers to compact, mixed-use, pedestrian friendly communities that are built in relation to rather than simply next to transport options, such as rail and bus stations. This type of development is often marked by large communal squares, mixed use pedestrian-oriented development, and hubs where people congregate rather than simply ‘pass through,’ such as farmers markets, small parks, and lively streets. Over the past two decades there has been a rapid growth in BRT systems in the world, with 168 cities currently implementing BRT systems, up from 17 in 1990. However, there is little empirical evidence about BRT systems’ capacity to guide urban development. 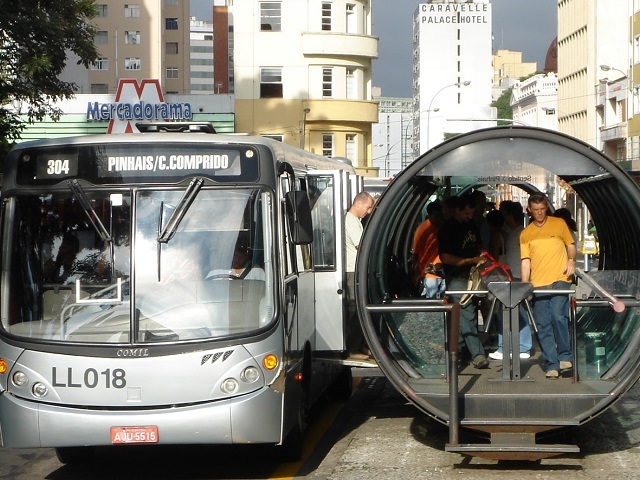 The relationship between BRT and property values in close proximity to transport has been studied, but despite Curitiba’s experience encouraging high density along Bus Rapid Transit (BRT) corridors, little is known about BRT’s capacity to generate more compact urban forms and encourage transit-oriented development (TOD). How BRT can influence redevelopment, land use change, and different social interactions between the public and private realms are part of emerging questions asked by policy and decision makers, planners, developers and communities living in close proximity to BRT networks. Without knowing exactly how BRT systems influence the wider urban form, the harder it is to holistically assess how effective public transport not simply provides an alternative to private cars, but creates more vibrant public spaces, more equitable access to jobs, land use planning and transit integration through growth management mechanisms, more efficient land use patterns, affordable housing close to BRT networks, and captures value by local governments. Empirical evidence on BRT’s effects on urban development, redevelopment, and land use change is still limited. Lack of built environment data makes it more difficult to establish what type of urban development takes place around BRT stops. Land use data along BRT corridors is not always available, so it is often necessary to walk around BRT stops to collect data such as parking (off street and on street), level of land development, floor area ratio, construction conditions, building heights, pedestrian infrastructure, levels of vacant land, and the presence of affordable housing and slums. However, there is important progress underway. Two research projects, one developed by the Carolina Transportation Program (UNC-CH) and the Lincoln Institute of Land Policy in Latin America and another under development by EMBARQ India, seek to bridge this data gap. Urban development typologies around BRT stops have been identified in Latin America and India by running factor and cluster analyses based on built environment data collected by walking around a sample of BRT stops. 10 BRT typologies were identified in Latin America, based on built environment data collected around a sample of 81 BRT stops located in seven cities in Latin America. 15 BRT typologies were identified in India, based on a sample of 33 BRT stops located in Ahmedabad and Indore, India. These BRT typologies can help planners to understand different types of potential future development that can take place around transport stops, which is important for cities with different characteristics than Latin American or Indian cities to still be able to understand how BRT systems will influence urban development. Even with these studies, it is unlikely that BRT systems will impact all growing cities similarly, or that the same policy mechanisms will impact development in the same way. BRT networks in and of themselves have the ability to reduce travel times and transport costs, and reduce air pollution and greenhouse gas emissions. However, they have the ability to do much more than this, from breaking down socio-economic divides, reducing urban sprawl, and fostering economic growth. Although planners can see these positive attributes from experience, it is important to work towards creating the empirical backing for this thinking, as well as actionable methods and policies that planners in developing countries can use to holistically implement transport systems integrated to land use planning mechanisms in order to guide urban growth and encourage transport oriented development at the same time. Erik Vergel Tovar is a Ph.D. Candidate in City and Regional Planning at the University of North Carolina Chapel-Hill. He was a presenter in the “Future Leaders in Sustainable Transport” session at the Transforming Transportation 2014 conference. You can access his entire “Pecha Kucha” style presentation here.